« Jim Ewing presents at GrowFest! Heirloom tomato and pepper seedlings in the foreground, and a forest of ginger and turmeric in the back. A few days ago I paid a visit to Bee Heaven Farm, and took a peek inside the big, new greenhouse. 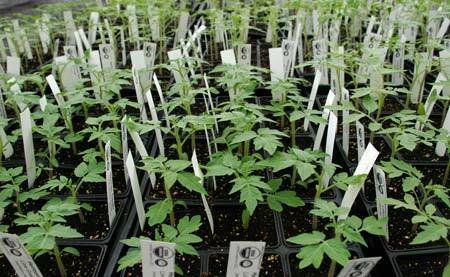 What I saw was amazing — a sea of vegetable and herb seedlings growing in flats of little black plastic pots. They filled almost one half of the 60 foot wide by 90 foot long greenhouse. In the other half of the greenhouse was a double row easily 60 feet long, of larger plants, mostly ginger and turmeric, growing in large felt pots. I lost count of how many plants I was looking at, so let’s just say that there was about 250 square feet of young plants and seedlings. That’s a lot more than what Farmer Margie Pikarsky had started this time last year, growing plants on long benches made of recycled wooden pallets. 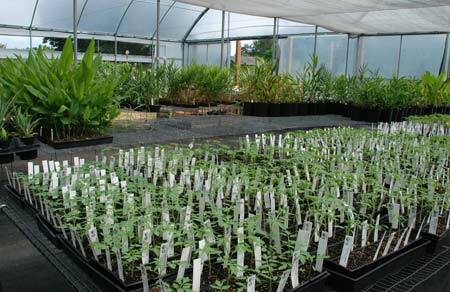 Almost all these young plants are destined for the farm’s seedling sale at Redland GrowFest! which is coming up this weekend. The sale is the heart and purpose of the festival, started and run by Margie, which celebrates all things local and growing. As I strolled up and down the greenhouse rows taking pictures, I stopped here and there to read the labels. Herbs include Cuban oregano, basil, lemongrass and cilantro. Hotheads will rejoice to see a wide variety of peppers, both hot and mild — datil, bird, bishop’s crown, hot thai, wiri wiri, Anaheim, Jimmy Nardello and cachucha, to name a few. And fans of heirloom tomatoes have the usual wide assortment to choose from. Shapes and colors range from large, small, pear shaped, oval, round, yellow, orange, black, green striped, and of course classic red round and plum. The names of the heirloom tomatoes are just as varied — green envy, Juliet, podland pink, Ukrainian purple, black krim, sweet million, sunset pear, Japanese oxheart, garden peach (yes, a fuzzy tomato! ), Arkansas traveler. These are tried and true varieties that do well in our South Florida heat and humidity, and which Margie plants on her farm season after season. To make sure that everything is safe, and no flies are found, Margie explained that all plant and fruit vendors had to sign an FDACS compliance agreement that stated they are taking all required precautions against the OFF. “Fruit has to be covered to provide protection for the potential host material.” Fruits in season now are avocados, guavas, carambola and pitaya, and they will have to be kept inside fine mesh screening or plastic containers to keep the dangerous little flies away. The OFF lays its eggs inside fruit. No fruit — or no access to fruit — there’s no fly and no problem. The only thing that visitors can’t do is bring fallen fruit out of the park. 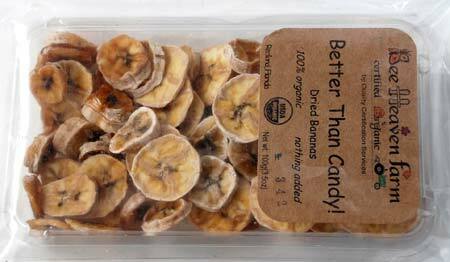 Dried bananas are sweet, chewy, and full of real banana flavor. You won’t find fresh fruit at the Bee Heaven Farm tent. “Dried fruit is my thing,” Margie said, and her fruit dryer has been humming night and day this summer. She is offering a choice of dried carambola, mamey, mango, persimmon, or bananas, and a mixed assortment called Fruits of Summer. Fruit that has been processed in some way — dried, or made into jam, for example — is safe against the fly. So come to the festival to buy seedlings and plants for your garden this growing season, and stay to listen to live music, and eat delicious local food. There’s a full schedule of live demos and presentations given by gardening and plant experts who will share a wealth of knowledge — all included in the price of admission! It’s the fourth year for Redland GrowFest! and it looks like it’s going to be the best year so far. Lovely start to our Fall in South Florida. Long summer it twas.